With such an abundance of WordPress themes available, finding your responsive theme of choice may be a difficult task. That’s why we've put together this list of 15 of our favorite themes for 2019 that you can review and consider for your own website. Below, you'll find feature descriptions for all 15 options as well as a few key takeaways for those of you who are looking to find a theme as efficiently as possible. Excellent is a responsive, multi-purpose Wordpress theme focused on businesses and e-commerce sites. With a variety of different sections that you can add and move to suit your business' needs, as well as a wide range of navigation menu options, there are hundreds of ways to customize your company’s website. 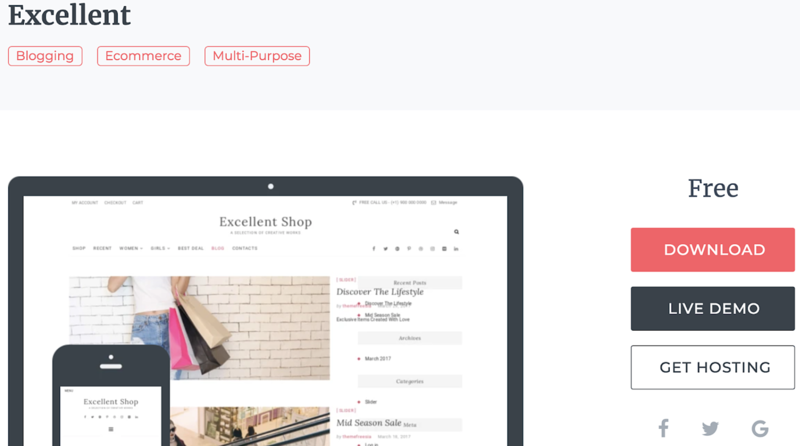 The theme's WooCommerce integration allows you to simplify the management of your online store and gives you the ability to add sidebars with links to all of your social profiles so your customers can easily view and follow your accounts. Tiny Hestia is a responsive WordPress theme for bloggers. The theme has a minimalist design so your visitors can easily navigate your site and focus on your content. Tiny Hestia is a child theme of Hestia — child themes allow you to modify your current theme to enhance functionality. So, if you are already a Hestia user and want to customize the theme to make it better suited for sharing blog content, you can install Tiny Hestia. When you install a child theme like Tiny Hestia, you don't lose your ability to update the theme or lose any of your original content.